London South Bank University (LSBU) is one of a select group of universities nationwide, and one of just two in London, that has been chosen to receive government funding to deliver Higher and Degree Apprenticeships for apprentices from non-levy paying employers. LSBU achieved full marks, an impressive 1700 points out of 1700, in the scoring process to gain support from The Education and Skills Funding agency (ESFA). This enables the University to confirm places now for apprentices from the thousands of non-levy employers, including those that have been sending their staff to study at LSBU for many years. On Friday 8 December ESFA published the outcome of its review into guaranteed funding for new and existing non-levy paying employers offering apprenticeships to ‘new starts’ for the period 1 January 2018 to end of March 2019. 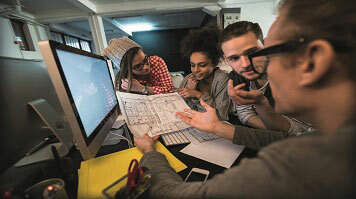 From April 2019 EFSA intends that all employers will use the Apprenticeship Service to access apprenticeship training for ‘new starts’. Professor Pat Bailey, Deputy Vice-Chancellor of LSBU, said: “This very good news for London’s employers, including our many local Small and medium-sized enterprises (SMEs). It means that the University will be able to guarantee a firm offer of apprenticeships to employers and their staff for 2018 starts”. For more information please contact the LSBU Apprenticeships Team.